Filled crepes. Wholesome Traditional Quality: No preservatives; No artificial flavoring or colorings; 0 g trans fat. 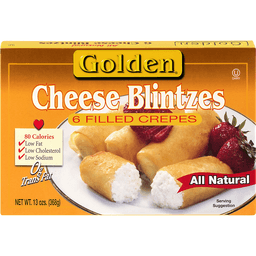 Per 1 Blintz: 90 calories; low 1 g fat (2% DV); low 0 g sat fat (0% DV); low 10 mg cholesterol (3% DV); 150 mg sodium (6% DV). From Our Kitchen to Yours: Generations have grown up enjoying Golden products. 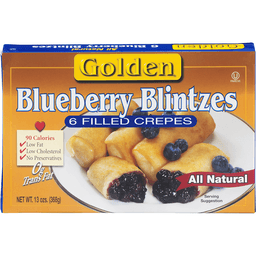 Since 1951, we have proudly been making delicious blintzes using wholesome, healthy ingredients; without preservatives, artificial flavors or colors. In 20 minutes or less you can conveniently serve these delicious blueberry filled crepes at your next simple meal or part of your family's holiday traditions. We are honored to share a place at your table. www.oldfashionedkitchen.com.